Update 2018: New editions of both these books are now out, making these great additions to your pannier. Some of the best-read articles and blogs on Freewheeling France are those dedicated to cycling in Brittany, and in particular the articles on cycling Brittany's canals and green ways and our articles on cycling the Nantes-Brest Canal and the history of the Nantes-Brest Canal. Whenever someone emails to ask for more information on cycling in Brittany, I usually direct them to two excellent books, both published in Brittany by Red Dog Books, an independent publisher with specialist knowledge of north-west France. 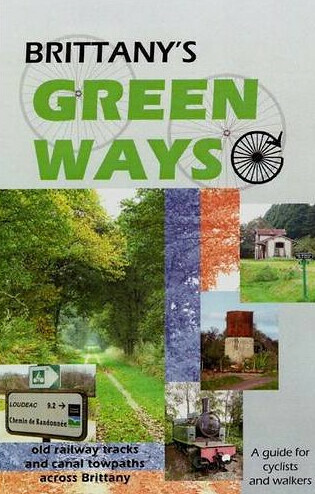 The first book I often recommend is Brittany's Green Ways: A Guide to Re-Used Railway Tracks and Canal Towpaths (UK, US, Fr), which covers Brittany's network of canal towpaths and converted railway lines. The second book is simply titled The Nantes-Brest Canal (UK, US, Fr), a guide for cyclists and walkers. It's by Wendy Mewes, the lady behind many of the cycling in Brittany articles on Freewheeling France (see Redon, Dinan, Vannes, Quimper, Carhaix and Lorient). The Nantes-Brest Canal guide is available in hard copy and also now available as an e-book directly from Red Bog Books. Its hyperlinks direct you to further information, and can be used to book accommodation or download maps of cycling circuits. It's available for PC and Mac users, who can download the free Javelin reader.